Another surprise came when the General Attorney stated that the rescue package must be a subject to a parliamentary vote. The Government Spokesman just added, that: “It is not possible that other parliaments in Eurozone are deciding on rescue of Cyprus, but the Cypriot’s one doesn’t.” It’s expected that the vote will pass easily, but this expectation was there also before the first vote, which didn’t work out as we already know. A leaked document on internet says that the Cypriot economy will fall down by 12.5% in the coming 2 years. Slovenian Prime Minister promised that there shall be no rescue in Slovenia, although the situation is critical. In a fight to postpone all problems to the most possible distant future, she recorded first victory. Ljubljana sold short (18 months) debt for 1.1 billion and wants to use the proceeds to cover part of the old maturing debt. Just for your information, Slovenia has to get somehow this year 3 billion for the running expenses of the state administration. Bank recapitalization can eat additional 7 billion euros. This is about 5000 euros per each Slovenian citizen. This won’t be easy. State of Slovenia controls approximately one half of companies in the country. Let’s wait whether they will start selling out these or whether they will finally ask for money also from us. To make it a bit more complicated, real estate prices are still falling in Slovenia, by 8.8% in a year-on-year comparison. Even worse situation is in Spain though, where the real estate prices plummeted by a record 12.8% (y-o-y) and currently are at 2004 levels. The promised 100 billion help might very well not be enough. Greeks can rest for a while. They managed to secure another loan tranche from Troika, which has been kept on hold since March. They also got to find the use of saying “The wolf got fed and the sheep remained alive”. They promised to lay off 15 000 state employees, but in turn, also promised to hire the same amount of people back. If you don’t understand, you are not alone. Unemployment in Greece even without these wise tricks reached a new record of 27.2%, which is a third higher when compared with the same month last year. We hope that there will remain at least some other employment opportunity than civil service – after the three years of saving Greece! More and more thicker storm clouds are gathering above Netherlands, which is still perceived as one of the more responsible countries in Europe. Netherlands has been in the excessive deficit procedure since 2009. Few days ago the Finance Minister declared government’s intention to fight the deficits but few days later the Prime Minister Rutte suddenly turned the direction by 180 degrees. The already written consolidation measures were postponed after a new agreement with the Unions and other employer representatives became effective. The deficit will be allegedly reduced thanks to the supposed economic growth. “We will simply grow out of problems” is being claimed also in the Netherlands from now on. Wilders’ eurosceptic PVV party is currently leading in the polls. No wonder Brussels is a bit nervous about all this. It’s already some time since it became public, that Brussels is paying internet commentators, who work towards improving his image. Lately the journalists found out, that Brussels is also financially supporting groups dedicated to stifling free media. Criticism harms the cohesion! French President Hollande also has to fight the negative image in media after the scandal of his minister. He, however, chose a bit more congenial way and ordered everyone in his cabinet to publicly declare their property. There are no beggars in the Socialist Party. 8 out of 37 members are millionaires. The Foreign Minister is the luckiest with assets above 6 million euros. We wish them fruitful fight against the greedy French wealthy people, a fight upon which they build up their political programme. In just few weeks, EU will welcome a new member. Croatians celebrated their admission into the Union by a 20.7% participation rate in the European Parliament election, the forth lowest one in the history of the Union. Just out of curiosity, Slovakia holds the first and the second place, when the participation rate in 2004 vote was less than 17%. Worse and worse news keeps coming from Hungary. Country is sinking into an economic black hole. 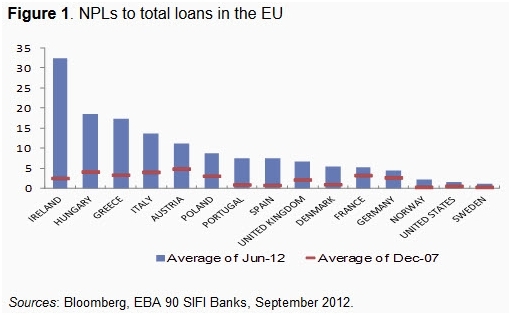 The level of non-performing loans is worse than in Greece (see the chart) and Prime Minister Orbán feels so spowerful that he is not even interested in political marketing any more. Lately, he proclaimed that all sanctions that they will get from the EU will be directly placed on citizens’ shoulders via a special “fine” tax, which they already included in their Constitution. We do not believe that state expenses can be covered otherwise than via transferring them to citizens. But most politicians at least try to cover the transfer of cost in nice words. Some tips how to spend these nice days? If you like culture, you can try the latest Estonian Austerity Opera about the fiscal consolidation and crisis fighting in the country. You can enjoy operatic work based on Twitter opinion exchange between American economist Krugman and Estonian president Hendrik Ilves. If you rather fancy playing something, we recommend the new hit from ECB. A game named Top Floor is a sophisticated simulator of a life of an ECB officer, who has to work his way to the top by collecting documents. We wish you a successful journey up to the top!